iPhone 4 cases are not just a “look-good” accessory but a practical requirement of the cell phone, you probably want to purchase it to protect your phone from any potential damage. However, these cases are also used to enhance network and signals, believe it or not! Often the placement of the hand can cover the cell phone reception area and interferes with clear quality voice calls, having a case will improve signal strength by ensuring that nothing covers the speakers and mic area. With so many iPhone 4 cases in the market, it can be slightly confusing when deciding to purchase one, while some just go for the one that makes your iPhone 4 look better regarding appearance, others can be a bit more specific about the nitty gritty of the case. We have compiled a list for you to make life easier, after reviewing a huge lot of we narrowed our list down to five of the best iPhone 4 cases in the market. How do I attach the iPhone silicone case to my iPhone 4? How do I remove the case from my iPhone 4? What if I don’t like my case? Which case is more durable? Which iPhone Cases are for girls? Out of all the iPhone 4 cases, this is possibly the best one out there in the market for its various benefits; it is easy to install around your phone and can be removed without too much hassle too. The flip case is closed with a magnetic binding to ensure your phone does not slip out of its cover and endure any damage, not only is it protective it is also lovely to look at as it is available in various colours and printed designs. It is designed to protect your phone from scratches, impact and even dust. The case can also be used as a stand to get you amazing horizontal view selfies. As it’s a “wallet leather case” it has card slots so you can conveniently place up to three cards, so you don’t have to go on a rampage hunting in your bag when you need to use your card. You can even access the ports and buttons without having to remove the case which is always extremely convenient. 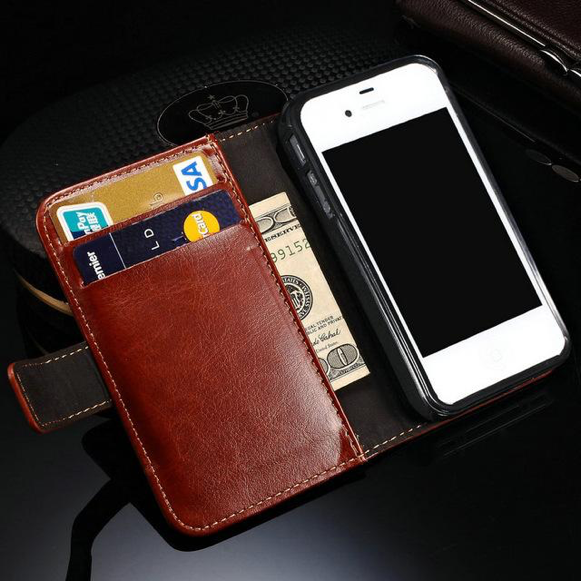 A beautiful and durable quality iPhone 4 case made of luxury leather. It is ultra slim and looks extremely stylish the design is attention-grabbing as it is made of such high-quality leather it seems luxurious although slightly more expensive than the PU leather case it won’t put a dent on your pocket but at the same time look like you spent a fortune on your luxurious leather case. It’s not just good to look at it also provides unparalleled protection to your iPhone 4 and iPhone 4S screen, you can even rest your phone on the fitted stand to watch videos and take selfies. The case has been designed with individual attention to details although you are protecting your phone you are not doing so at the cost of losing any buttons behind the cover, the buttons, cord ports, and camera are fully functional without having to remove the cover. You can even carry your important cards with you on the card slots, to top it all it comes with a microfiber cloth and screen protector. What else could you ask for? Integrated wallet- credit card slots. This luxury case is also available for the iPhone X! So if you know a loved one with an iPhone X device and are looking forward to buying this case, don’t forget to share this page with them. If you’re one of those people who purchase iPhone 4 cases based on looks rather than features. This is the perfect case for you, with multiple colours and patterns of rhinestones it’s a treat to look. This one also comes equipped with card slots so you can conveniently place your important credit cards nearby. The protection isn’t as good as the cases mentioned above but it is an excellent feature of the cover as it comes in hard plastic on the inside and the outside is coated with PU leather, the invisible magnetic closing feature also ensures the protection of your iPhone. 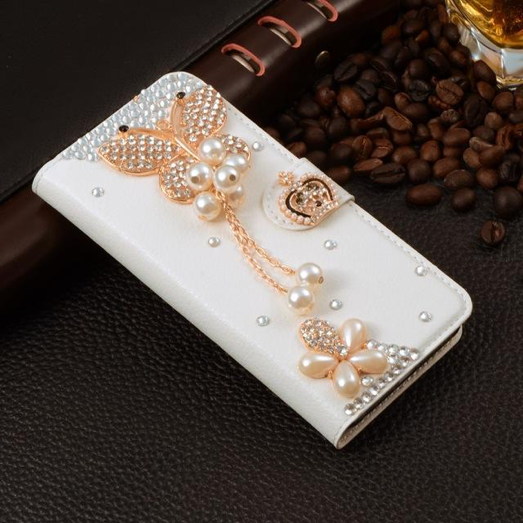 The rhinestones on the outside make your cell phone seem glamorous and elegant, all the features of the phone are accessible through the cover, so there is no hassle of having to take off the cover to operate any buttons or access ports, furthermore, it protects your phone from impact, scratches, and dust. To top it all this case is handmade. 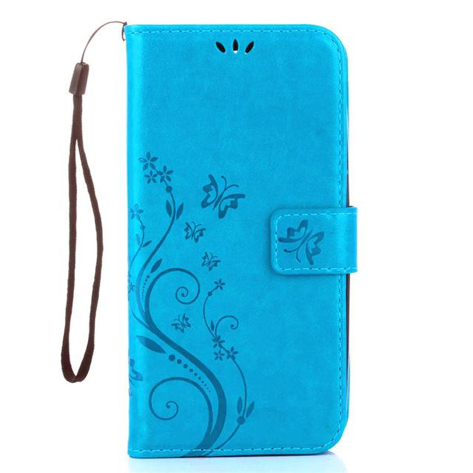 We have iPhone 4 cases for every age group, and this one is more popular amongst teenage girls. In fact, it’s trending every girl wants one of these, and they’re adorable! Available in a variety of designs and characters ranging from bunny ear cases to Minnesota mouse ones, this one is popular for its style. It protects the back of the iPhone, but it is more famous for the way it looks rather than how well it protects the phone. It does protect the phone from the impact as it is made up of top quality TPU material. iPhone 4 cases are small, but this one fits perfectly in the palm of your hands, And even better your phone fits right into it like a glove, you can slide it in and out of your pockets with great ease because it’s so thin and lightweight you don’t feel like you’ve added a bulk of weight to your phone. 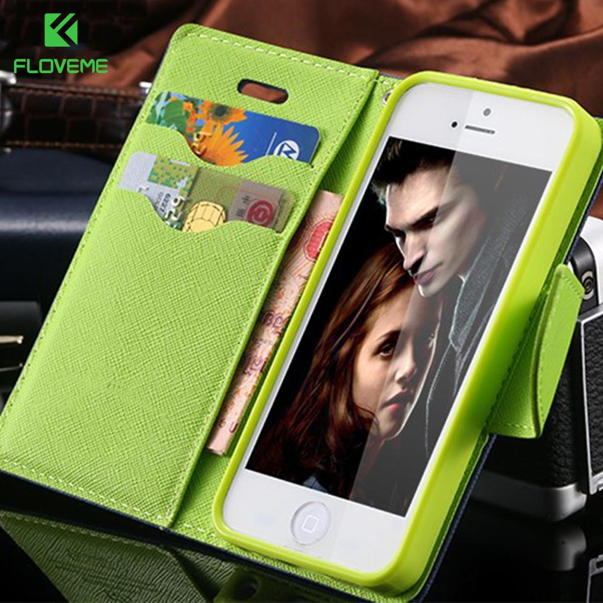 The leather used to make this case is high-quality leather, it is durable, it also comes with a card slot to place your card in to for convenience, this can be very practical when you go shopping. It comes with kickstand features so you can enjoy watching videos by placing your phone horizontally. The case is soft so allows protection of the edges of the of the phone from scratches and dust. All the buttons, camera and ports are easy to access. customer review: “great to watch movies on and very convenient when I go shopping, good buy, highly recommended”. 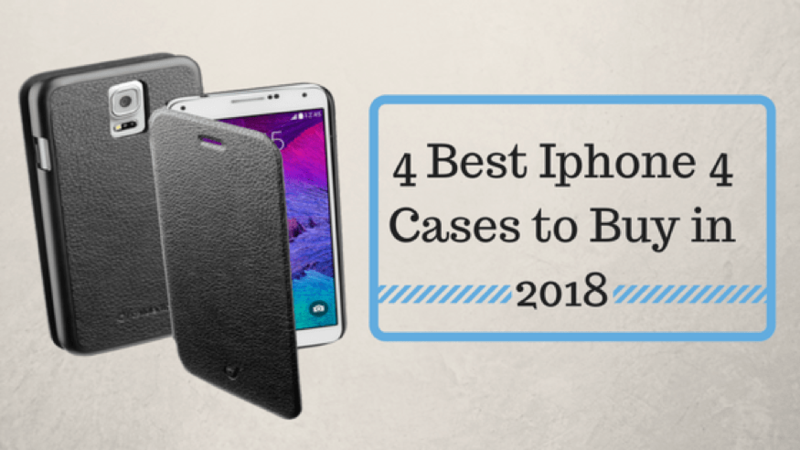 We hope this lost proves helpful to you, we tried our best to review the best iPhone 4 cases available on the market and narrowed the list down to this. Now, we know cases aren’t the only things that put some colors. Therefore, we also published some awesome iPhone wallpapers that you would love to use on your iPhone 4 device. You can check them out by viewing this page. It’s simple! Just slide the phone into the slim case, the phone will automatically slip into the case holes designed to make the phone more convenient, once placed, align with holes and snap the case into place. If you have an iPhone silicone case, it is more flexible and can be much easier to place your phone into it. Place your phone in the middle of the case and using your index finger pull the case around the phone starting from the top all the way around. The case can be removed simply to, turn the iPhones back towards yourself, pry your fingertips at the bottom corners of the cover and pull, the cover will pop right off, whether it’s these cool iPhone 4 cases have been designed to be easily removable and easily placeable too. Although our cute iPhone 4 cases are too cool to be returned, we do have a return policy in case you feel you wish to return them: we have a 90 days return policy of for some reason you wish to return your case, you can do so within 90 days of purchase. We go to extreme lengths to ensure our customers receive the best quality goods but we’re also adamant about the best customer service. Our cases come with an extra layer of protection to ensure safety from daily wear and tear, we use polycarbonate plastic and colour integration technology to make sure our iPhone 4 cases are durable and long-lasting, our customers are satisfied with our products, and that’s how we earn customer loyalty. We have a collection of iPhone 4 cases for girls and iPhone 4S cases for girls, but the rhinestone cases are unisex, although they are more popular amongst girls because they are available in colours such as pink and purple, we have a boys collection too which is available in our Estore. If you have an iPhone 4, it is practically a requirement to get a case for it. For your iPhone 4 and other Apple phones, you don’t just want the case for the usual reasons. You want an iPhone case not just for protection but also for aesthetic reasons. iPhone cases come in all sorts of designs, adding personality to your phone along with extra protection. It was 2013 when Apple discontinued iPhone 4 but it recently had a revamp. As one of the company’s longest standing models, Apple reintroduced the model with better features from high-resolution display and more. If you plan to buy an iPhone 4 today, don’t forget to get the best iPhone 4 cases for girls and boys to give added protection and style to your new phone. There are all kinds of cases on the market today from iPhone 4 cases for girls to iPhone 4 cases with shockproof and rubber matte features. When it comes to cases for girls, you have plenty to choose from with designs such as cute hello kitty cases, studded cases, 3D crystal rhinestones, and more. With so many to choose from, it’s a little tough but sure is fun to find the perfect iPhone 4 case for you.